How’s Your Winter Classic Boat Project Going? Ya Better Hurry…. How’s Your Winter Project Going? I recently stopped in on fellow Woody Boater Russ Arrand to check on the progress of a restoration project. Boy was I treated to a special day. There sat a bare wooden 1941 Century Sea Maid 16. He had just finished sanding and the alluring sculpture of the boat almost knocked me over. Russ had just used his dust brush and the boat reached, once again, that special moment in its life: it was braaaaand new, wood only! No hardware, no stain, no imperfections; simply a craft of bare wood with shapely lines. The fore view (above) showed its slim pointed bow rising to the dramatic crown of the deck. The aft view displayed the Century version of a barrel back stern developed by a tumblehome of aft sides and ultimately distinguished by the rounded chine at the bottom edges. It’s not every day you see bare wood just before the staining. It was a sight to behold. 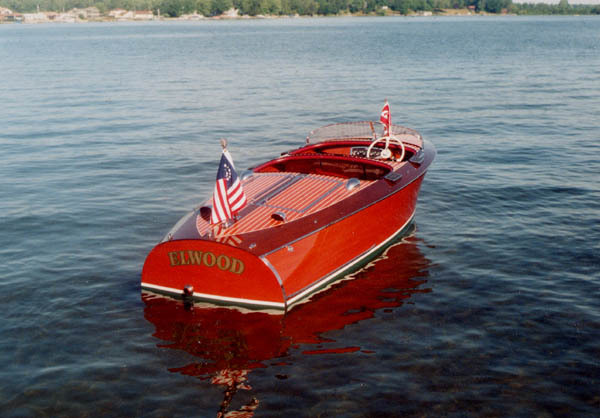 The smell of fresh mahogany, the beauty of the grain lines, just the prettiest little boat one could imagine. We placed some chrome on her just to get a peek into the future. The double cockpit 16 footer is a rare Century as few were made just before the cessation of pleasure products prior to WWII. In fact the boat was finally delivered to its new owners in 1945 with a 1945 Gray Marine engine; so its original moment in time was time delayed. All in all it was a rewarding stop in Cadillac, Michigan that day to see just how the winter project was coming along. Hope your project had its moment as well. B… E… A… Uuuuuuutiful. Thanks for sharing!! That is a beauty. I have a 1942 Utility 15 awaiting restoration in my shed which looks similar in shape. Notice on this boat there are only three very wide planks on each side. a very neat boat. I hadnt realized that century had started doing geometric patterns on the rear deck prior to the war. Although this one is somewhat more restrained than the later efforts. I see don ayers has beat me to the punch as I am writing this asking which model it is. on the same wave length i guess. This was the first year for what Century called stream flow styling… This basic look was on all dual cockpit forward boats, 1941-42. Frank; I think over the years Century had some fantastic designs. One of my favorites was a 1941?? split cockpit, I think 17′ or 18′. You could get it with the Gray FireBall and it was fast. Do you know which one that was? Nifty boat and gorgeous work by Russ. WHO did the restoration on that motor! I have a 4cyl Gray as well that I would like to get restored! It runs perfectly but I would love to have it restored and repainted and all that good stuff! Can anyone point me in the right direction? Here is the update since Tom was here. The boat has been stained, sealed, 10 coats of varnish on the boat and interior parts. We spray painted the bilge today. Mechanicals will start going in soon. A couple of more coats of varnish and the decks will be caulked and the names-numbers will go on. It is really starting to look good. It is probably going to Hessel, Traverse City, and Manistee this year. Owner lives in Holland, MI. A fun boat to restore. It has alot in common with the 1942 17 foot Sea Maid I did called Pipe Dream. I am looking forward to seeing how the round chine handles. Thanks Russ – The freshly restored Sea Maid looks great and thanks again to you and Mr. Holmes for sharing it with us here at Woody Boater. We would love to see some photos of the finished product when she is done, ready to begin the next chapter of her life. Didja keep the blue dress? The engine was done by CD’S engine service, Hudsonville, MI. I tried to e-mail these guys with the e-mail that is on the website but it got kicked back to me. Any suggestions for contacting them? No one picked up the phone either! Easier to just call them. Ask for Casey or Dave. They do fantastic work. I spoke with them the other day. I, for one, will not call them again. It is a beautiful Century. I restored a ’46 Deluxe Utility 15 and it was similar in hull configuration to the pre-war utility and double cockpit Sea Maid 15. It had the round chines – as did the Century outboards up to the Palominos. Mine had the Gray Marine 4-75 in it and I had the motor rebuilt. The boat would do an honest 38 mph with the single carb setup. It handled very well with the round chines and I had that boat “at speed” in some very rough water that I probably should not have. I believe – that the only “red” Gray’s in Century boats (4 or 6 cylinders) were the “Fireball series” which were generally “hopped up” a bit. Thus, the twin downdraft carbs on the motor illustrated. Pipe Dream. Seen it several times. Hard to imagine a prettier boat of its size.